Double Grammy Award Winner Jason Mraz has fulfilled his dream to become a music star, but his feet are still firmly planted on the ground, or more specifically, the soil. Conscious Connection recently sat down with Jason and learned how the theme of presence underscores his life of song, service, and stewardship, and how he encourages others to do the same. Conscious Connection: Thanks so much for taking the time to talk with us, Jason. I’d like to start with a question from one of our readers. Who influenced you musically as you were growing up? Jason Mraz: In my early childhood I was all over the map. I listened to the radio, and I listened to whatever my parents listened to, from the forties through the nineties. In high school, I liked Dave Matthews band, G. Love & Special Sauce, Soul Coughing, and Ani DeFranco. Then I learned who they liked, and I discovered Bob Dylan, Neil Young and James Taylor. But I never feel like I can answer this question completely, because music discovery isn’t finite. Conscious Connection: What artists do you listen to now? What brings you musical inspiration? Jason Mraz: It’s kind of the same today; I listen to all kinds of things. Though I will say when I want a serene environment, I listen to devotional artists like Madame Kare and Krishna Bhatt. Some friends joke and call it spa music, but I love devotional music because it contains sincere, passionate melodies over soothing foundations. You can also check out my personal mix for ‘gettin it done’ — perfect for whether you’re charging on a bike trail, surfing with headphones, or just raging in the desert. Conscious Connection: Let’s talk about your music. Your latest album, “YES!,” is acoustic. What was the inspiration behind the album? Jason Mraz: It all started in my backyard, and for that reason this album is the most personal-sounding album that I’ve made. I met my collaborators, Raining Jane, about eight years ago at a gig. I invited them to my house, and we immediately started to write music. And we made this music simply out of love for each other and love for the sound. Conscious Connection: Tell us about the album theme, and how it progressed to become the story you created. 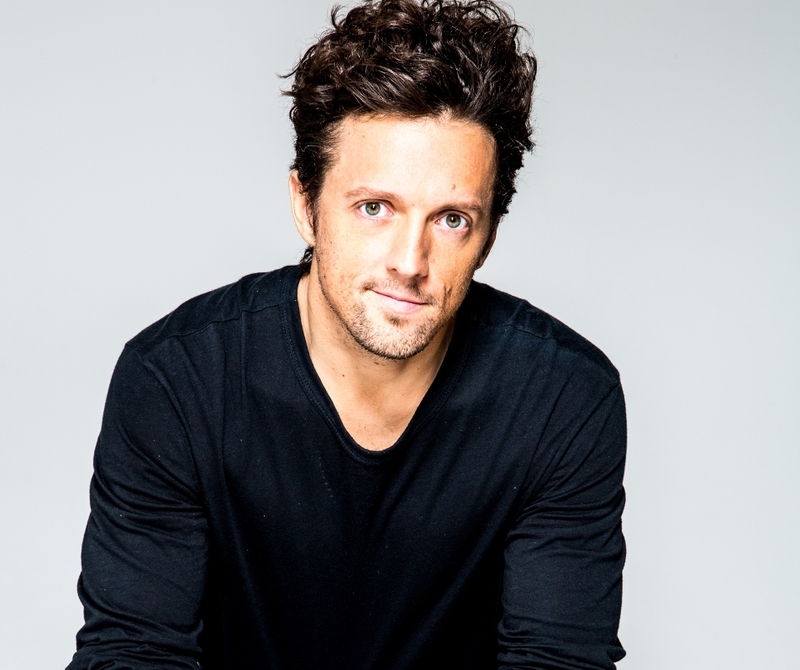 Jason Mraz: My collaborators and I found that we shared a common passion among the five of us, which is, to put it in your magazine’s perspective, consciousness. We love to write songs that remind us to be present: to forgive others and ourselves, to be compassionate, and even to remind us about environmental stewardship. The album we created follows that theme. And we wanted the songs to be transformational, to encourage others to improve the quality of their lives. After all, life is an inside job, and our own thoughts, our speech, our actions, our attitudes, and our beliefs determine our life experience. To sequence the album, I thought about the process I use when I put a set list together. When you create a set list, you want there to be purpose for the songs you’re playing. Sometimes you set a song up by telling a story, but sometimes you can just set it up with the song before it, and that’s what I tried to do on the album. We wanted to take the listeners on a journey, and then return ourselves and the listeners to the present. Conscious Connection: When listened to in its entirety, the album seems to unfold as a metaphor for personal transformation. It’s really inspiring. Jason Mraz: Absolutely — thank you. It’s great that you noticed that. Conscious Connection: Awesome. Jason, given your phenomenal career success, can you share some advice for struggling musicians, to help them keep moving forward? Jason Mraz: Never forget that music is the reward. If you feel like something’s missing, turn back to the music and remember how much music has given you already, and how much it can give you in the moment. And as far as finding a career path for it, don’t wait for anybody to hand it to you; it has to stem out of your joy. It’s through sharing your joy that people are going to want your music. I always recommend that a new artist just go somewhere and play. Find a favorite location, and then stay put. Don’t wander all over the city and be hard to track down. Find a street corner, find your YouTube channel, find your venue, find where you’re happiest, and share your joy. Conscious Connection: That sounds likes great advice. Jason, I know you walk the talk about living consciously. Could you tell us a little about some philanthropic initiatives you’re passionate about? Jason Mraz: Closest to my heart is a program in my hometown of Richmond, Virginia called Live Art. The program is hosted by The School of Performing Arts in the Richmond Community, and it nurtures the talents of individuals with special needs. It culminates with an extraordinary live concert in which students perform the content they created during the year. Performers Sara Bareilles and KD Lang were guest stars for the first two seasons. My hope is that this groundbreaking program will be replicated across the country. It’s been amazing to watch transformations occur not only with the students but also within the community that stands behind it. Another program I support is Kiss the Ground, based in southern California. Their mission is to educate others, especially young people and future farmers, about the importance of soil health and how to improve it. Fundamentally, how we treat our soil is how we treat ourselves, since our health depends on mineral-rich foods that come from the earth. And what’s more, the climate crisis our planet is facing can be reversed through our soil, because properly cultivated soil can actually reduce the carbon in the atmosphere. Along these lines, I also encourage people to buy food that has been grown locally rather than unconsciously consuming products from overseas. Buying locally helps you understand where things come from. In fact, the UN recently released a report that the future will be fed by local urban farms, so we might as well be the generation to start it. We need millions of farmers right now to replace retiring farmers. If we don’t inspire people to farm, we could end up being forced to eat processed, factory-farmed food. It really is a crisis situation. But at the same time, there is a good food revolution happening. Our generation wants fresh, healthy, organic food. Hopefully, that demand will inspire future farmers to become environmentally savvy and soil-conscious. In the meantime, as individuals, we can supplement our grocery purchases by growing a few things, even on our balconies or decks. If everyone did this, it would make a huge impact. Conscious Connection: Clearly you’re passionate about our generation’s potential to impact the world. What’s your best advice for our readers who also want to change the world, being able to do what they love? Jason Mraz: I think that the secret to improving the world is consuming less and living more simply. We need to mindfully avoid buying pointless stuff and eating unhealthy food, because all of that consumption ultimately uses natural resources. The more natural resources we consume, the more we suffocate our host organism, the Earth. But if we’re present about our consumption, we save not only money and natural resources, but also time and energy. In turn, we have that time and energy to fulfill our dreams and work on projects that are close to our hearts. So we need to be present about our consumption, especially of food and energy. That’s a huge way we can have an impact on the world. This Conscious Connection Enlightened Interview was conducted by Anthony Chiaravallo and edited by Gail Morrison.